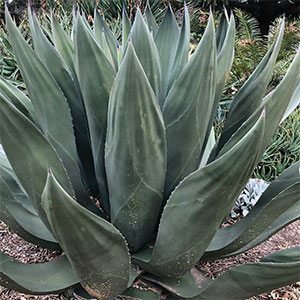 This is a large plant and over time Agave salmiana can reach nearly 2 metres in height. originally from Mexico where it used to produce a drink know as Pulque, it is as a foliage plant that it demands a place in the garden. The large green leaves form a neat rosette and the plant adds structure and interest grown in the garden or in a container. Agave salmiana will produce offsets over time and it will also flower. The flower stem can reach over 5 metres in height. After flowering the plant will die back, however the pups or offsets quickly replace it. From offset to flowering will take around 12 – 15 years. Best grown in a free draining soil and in full sun to a little afternoon shade, this is an easy care plant once established. Propagation is by removing offsets or from seed, which is surface sown and may take 4 – 12 weeks to germinate. Height – Usually to around 2 metres, plus the flower stem. Growth rate – Medium, slower in cooler climates. Flowers – Creamy yellow on tall stems.